The first turbine of the 1,218-MW Hornsea 1 offshore wind farm in the North Sea, the world’s biggest such facility, has been installed and is now generating power. 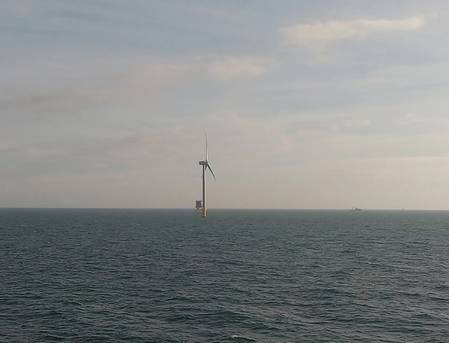 Matthew Wright, UK managing director of Danish energy group Ørsted A/S, described the installation of the first turbine as "a globally significant milestone". Ørsted co-owns the project with Global Infrastructure Partners (GIP) after selling a 50% stake to the latter in November 2018. Ørsted began offshore construction just over a year ago, and expects the project to be completed by Q1 2020. The project is located 120km off the Yorkshire Coast and will consist of 174 Siemens Gamesa 7MW turbines. The majority of wind farm’s blades are manufactured in Hull, from where they are shipped to the Hornsea zone. When fully operational, Hornsea 1 offshore wind farm will be nearly double the size (1,218MW) of the current world’s largest offshore wind farm, Walney Extension, and capable of powering well over one million UK homes with renewable electricity, generated by wind. Matthew added: “Hornsea 1 is the first of a new generation of offshore power plants that now rival the capacity of traditional fossil fuel power stations. Ten years ago, the thought of a project of this size was just a dream, but thanks to continued innovation, a determined effort from both the industry and supply chain to drive down costs, and the natural geographical benefits that surround us, the UK has positioned itself as a world-leader in offshore wind." Duncan Clark, project director for both Hornsea 1, and its sister project Hornsea Two, also under construction, said: “It’s amazing to think that just over a year ago we began offshore construction on Hornsea 1, and now, 120km off the coast, it has already started to generate clean electricity." To date, 172 out of 174 monopile foundations have been installed at the site, and turbine installation is expected to continue until late summer 2019. Ørsted operates more than 1,100 offshore wind turbines. It has installed approx. 5.6GW offshore wind capacity and has a further 3.4GW under construction. In addition, Ørsted has secured the rights to build approx. 1GW offshore wind in the US by 2023, approx. 1.1GW in Germany by 2025, and approx. 1.8GW in Taiwan.